Help take Saint John School to the next level – Tomorrow is Built Today! Tuition and fees alone do not cover 100% of the costs to educate every Saint John student. Tuition and fees go towards the operating costs of the school: teacher salaries, books and classroom materials, electricity, water, etc. However, for the school to improve over time, we need to invest in further improvements: upgrades to classroom space, modernizing facilities, providing state-of-the-art equipment, tuition assistance, competitive teacher salaries, along with new curriculum programs. The Annual Fund is a yearly campaign that provides revenue that allows us to go beyond the day-to-day operating costs and make progress toward our long-term vision and goals for the school. As these goals benefit both current and future students, we recognize that Tomorrow is Built Today! 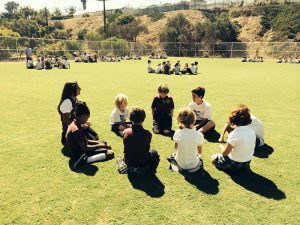 For more information about the Annual Fund, please contact the office of the Principal at Saint John School (760) 944-8227. Q: Why do we need an Annual Fund? Q: How do other schools fund themselves? A: Public schools in North County spend $8,000 to $14,000 per student and that cost is borne by taxpayers. Private schools may spend even more and that cost is typically reflected in higher tuition. 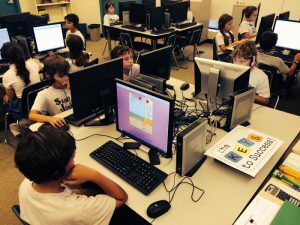 Saint John School runs efficiently and can achieve a lower per-pupil cost, but it still costs $7,100 per student in order to have great teachers and great programs. Catholic schools, as a matter of principle, try to make Catholic education affordable to anyone who desires a parochial education. Since there is a gap between tuition and the cost to educate, we have to make up the difference through fundraising and giving. Q: Why do we need the Annual Fund in addition to the auction and jog-a-thon? A: While these fundraisers help us to meet our annual operating costs, annual giving provides funds that allow us to go beyond day-to-day operations and meet the capital requirements necessary to make our long-term vision possible. The Annual Fund fosters a culture of giving. We are all stewards of something larger than ourselves and should help bring Catholic education not just to Saint John School but also to our entire community. The Annual Fund provides a giving opportunity to the broadest number of families, friends and benefactors. A: YES! 100% participation is important to meeting our overall financial goal. 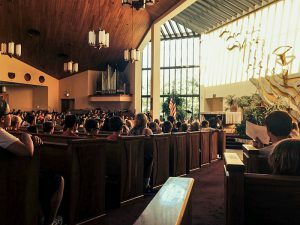 Before outside funding sources, like foundations, will consider donating their dollars, they want to know that Saint John School families are supporters as well. With the increasingly competitive market for Southern California education, a high participation rate toward the Annual Fund is extremely important. Q: Why not charge the full cost for the services provided rather than asking for gifts? Why doesn't Saint John School just raise tuition to cover the additional expenses? A: The difference between the cost of education and the tuition charged is $1,300 per student. The suggested donation level per family for the 2018 - 2019 Annual Fund “Tomorrow is Built Today” campaign is $1,000. It is our hope that all stakeholders dedicated to the success of Saint John School prayerfully discern a meaningful amount to donate. Remember your gift is more than a check. Your gift is a witness to your faith in Catholic schools. Q: I cannot donate at the suggested donation level. How else can I help? A: Not every family can afford to donate at the suggested donation level of $1,000 per family. However, you can help increase donations by using the PledgeStar system to make it easy for friends and family to contribute to the Annual Fund. All donations received through PledgeStar will be included in your family’s total contribution. A: Yes. It is possible to make a donation spread over several months or a one-time donation. To make your donation go to www.saintjohnschool.com/development or complete the Annual Fund pledge form. Donations spread out over time can be made in installments for a set payment period such as 2, 4, or 8 installments. Payment options include check, credit card, debit card and can be made online or by phone. Once your pledge form is complete we will automatically charge your credit card based on the payment installment you have selected. If you need any other payment arrangements, please contact the office of the Principal. A: Yes. Many employers offer Matching Gift programs. Please take the time to determine whether your employer offers such a program – it could serve to double your donation! In some cases, gifts from spouses, and retired employees can be matched as well. Do not hesitate to ask the school for whatever documentation you might need in order to facilitate a matching gift. A: The general rule in the “not for profit world” is that everyone with an interest in the organization should contribute at least one of the so-called "Three T's" – Time, Talent or Treasure. Undoubtedly, each of us can contribute to the school in one or more of these areas, each of which is essential to the success of our school. However, please note that it is still extremely important that we have 100% participation at some giving level in the Annual Fund. Planned Giving & Bequests: There are many ways you can help the school through planned giving-options including bequests, annuities, and trusts, to name just a few. IRA Charitable Rollover: IRA owners, beginning at age 70½, are permitted to make outright charitable gifts totaling up to $100,000 per year from their IRAs directly to eligible charities. The donor does not have to report the distribution as taxable income. Consult with your financial advisor for further information. Building Outside Support for Saint John School: Spread the word about Saint John School! Be an advocate for the school! Ask your family, friends and employers to make donations, or simply make an introduction to the school. Use the PledgeStar system to easily invite others to participate in the Annual Fund campaign. Volunteer: If you see a need that you can help fill, don't hesitate to speak up and let us know on the Pledge Form. THANK YOU FOR YOUR SUPPORT OF SAINT JOHN SCHOOL! If you have additional questions or concerns, please feel free to contact Saint John School Principal at (760) 944-8227. 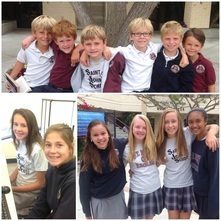 Please help take Saint John School to the next level by donating to our Annual Fund.